August 5, 2011  Small beer brewers in Massachusetts were shocked Monday, when the state alcohol commission announced a new rule that any "farmer-brewers" in the state must grow at least 50 percent of their beer's hops and grain themselves, or on a domestic farm they've contracted for the purpose. August 4, 2011  Is Budweiser puttin' on the Ritz? The self-crowned King of Beers will soon be sold in a newly designed can — one whose graphics are dominated by a bow tie. 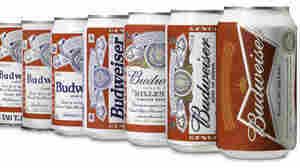 And the can's new design, its 12th since 1936, was created in London. July 29, 2009  President Obama chooses his brew for the get-together at the White House.